Australian thrash metal for the masses, destructive blasts for the master plan. Now here is a band who understand what it is to create blazing and violent metal that hearkens back to the good old days while simultaneously showing us a way forward for the genre. 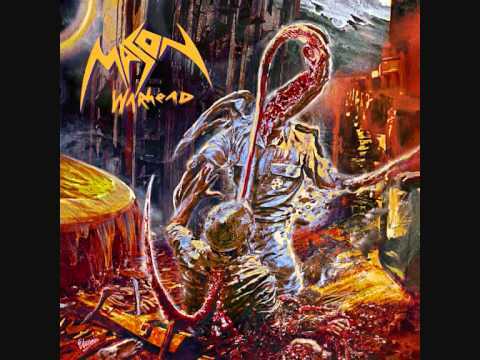 A record I have been meaning to review for a while Mason's Warhead is a modern day thrash metal record that fuses styles to get something exciting and explosive. One of the coolest exports to come from Australia in recent years Mason are here to smash your face in then brag about it to your friends. One of the coolest things about this record are the sing a long choruses. They really get the listener involved and help them to hook onto some of the juicier riffs. One great example of this is on the explosive playing on the penultimate track Ways of the Weak. Another highlight of this album is the explosive lead work. The solos are often flashy and passionate, but rather than making the music boring they add a dash of flavor into the thrash metal mix. In other words, with Warhead Mason find all of the things required to make a great thrash metal record, fuse them together, and come out with something that is chock full of speedy riffs, blasted choruses and soaring solos. In conclusion, if you're looking for a thrash metal band who will go beyond the standard self imposed limits most modern thrash bands live by then Mason is for you. Easy to get engaged in and worth many a spin Warhead showcases the kind of band who can stand the test of time. I for one am very excited to hear how Mason develop in their future, I want to see their polished thrash metal sound taken to a new level of speeding, grinding thrash goodness. As is though, Warhead is a crushing debut and worth checking out for any modern thrash fanatic!